DETROIT (AP) — The Detroit Lions and Chicago Bears will meet for the second time in 12 days — yet this matchup already looks a lot different. Mitchell Trubisky, Chicago’s starting quarterback, is doubtful for Thursday’s rematch with the Lions because of a right shoulder injury. “We’re on a short week. So regardless, there’s not a lot you can do. 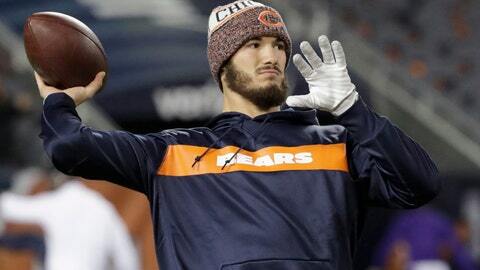 The nice thing about having a guy like Chase, regardless of which direction you go, is I was Chase’s quarterback coach in Kansas City for three years,” Bears coach Matt Nagy said. Trubisky threw for 355 yards and three touchdowns in Chicago’s 34-22 win over the Lions on Nov. 11. Now the teams face each other again less than two weeks later. The Bears (7-3) have won four straight. Detroit (4-6) is in the middle of a three-game homestand that began with a victory over Carolina last weekend, but rookie running back Kerryon Johnson left that game with a knee injury. He won’t play Thursday. So both teams have health concerns coming into this game — and they haven’t had much time to adjust to any potential lineup changes. The 32-year-old Daniel has started two games in his NFL career, and he hasn’t attempted a pass since the 2016 season. The Lions haven’t had much time to prepare for this game after playing last weekend, but the Bears had even less time to recover, since their Sunday game against Minnesota was at night. So when Thursday’s game kicks off around 12:30 p.m. local time, Chicago will have had about 3½ days since the end of its previous game. “Our guys, once we knew it, we prepped them on what our game plan is as far as making sure they’re mentally and physically strong and how they have to treat it,” Nagy said. Kenny Golladay has a long way to go before approaching Calvin Johnson’s accomplishments, but the 6-foot-4 receiver has already made his share of acrobatic catches in his young career, including the winning touchdown against Carolina. Golladay became even more important for Detroit after the Lions traded Golden Tate — and now that Marvin Jones has missed time with a knee injury. Jones has been ruled out of Thursday’s game. Detroit’s Matthew Stafford has a passer rating of 100.8 in his past six Thanksgiving games, but he’ll have his work cut out for him against a talented Chicago defense — and with Johnson and Jones unavailable.